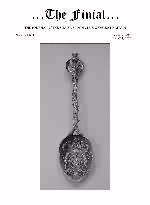 The Finial is The Antique Silver Spoon Collectors' Magazine. 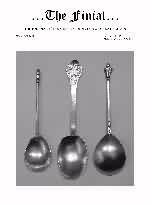 The Finial aims to enhance knowledge and enjoyment for the antique silver spoon collector. It offers subscribers an affordable market place to buy and sell silver spoons and promotes the general appeal and prestige of collecting quality silver. The Finial focuses on the many issues relating to antique silver spoons and related table flatware. 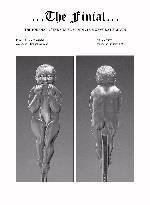 The Finial appears bi-monthly and includes essays, auction reviews, member's' views and questions. Each issue also features details of the latest postal auction. Much of the appeal of The Finial for subscribers is the diversity of its features, articles and essays. Teaspoons, salt spoons, dessert spoons, basting spoons, table and serving spoons have all taken centre stage in The Finial from time to time. Previous features have included the low-down on subjects as diverse as Apostle, Trefid, Dognose, Hanoverian Rattail, Old English and Fiddle pattern spoons. Hallmarks, notable silversmiths and English & Scottish provincial makers and their marks have also appeared in The Finial. The auction reviews, with prices achieved, cover all the major auctioneers that hold specialist spoon sales and our reports are often accompanied with personal accounts by members. Every issue of The Finial includes the popular Postal Auction, which is only open to subscribers. All lots are illustrated with their hallmarks. Outside of the UK The Finial also have members from across the world including Europe, America and Canada to, Africa, Asia and Australasia. The Finial is edited and published by Daniel Bexfield every two months and back issues will be updated on this website periodically. New subscribers are always welcome. Annual U.K. membership is £39.00. If you would like to subscribe to The Finial, please click through to the subscription page. Subscribers can also order up back issues, available at £6.00 each while stocks last. Please click through to Back Issues to request copies of previous issues of The Finial.